With a strange name that appears twice, badis badis is a unique fish which is rather small yet is able to change into a number of colors depending on its mood. Also known as Blue Perch, the fish belongs to the family of the Badidae in the order of Perciformes. Native to several rivers in India including Tumapao River found close to Duma, Yamuna River in the Himachal Pradesh State, Dibru River Basin and Mahanadi River in Orissa State among others. Other countries where the fish can be found include Bangladesh, Nepal and Pakistan. The fish inhabits rivers with slow moving waters that are not only shallow but wide as well. They enjoy swimming in waters with marginal vegetation yet turbid with sufficient mud that promotes the growth of certain aquatic plants. For this reason, the fish is unique to India where most rivers are used for the irrigation of rice and as a result are brownish in color. A dark spot above the base of the pectoral fin. Dark markings can be spotted on the dorsal fin. The same applies to the base of the dorsal fin where only a single marking is found. On the flanks are dark markings that come in a series. Has a color pattern that comprises of at least 11 vertical bars. Red and black pigmentation on the caudal peduncle and flank. Females are slightly smaller and appear less colorful as well. However, they are more round than the males. On the other hand, males are more slender but possess quite attractive colors that become more pronounced during breeding when they seek attention from females. From experience, most hobbyists affirm that various types of fish do well in large water tanks as opposed to small aquariums. This can be attributed to the fact that in their natural habitats, they enjoy free flowing waters in non-restricted areas. For this reason, it is often better to house fish in sizeable tanks that offer them sufficient space to swim and play. A tank that is no less than 30 gallons. A substrate comprising of sand and gravel. Some rocks and pebbles should be present to provide a kind of cover when the fish needs to rest. Plant species that will provide shades and hiding place. Tanks with plant life look more natural. Driftwood twigs, plant branches and leaves that float on the water. Water temperatures at between 15 and 25 degrees Celsius. A water hardness of 54-258ppm. As a matter of fact, cave-like structures that will be essential when the fish is to breed. Hobbyists often use coconut shells that have been divided into half, or pots made of clay that have some holes drilled into them. The clay pot parts can be designed to mimic the shape of the half coconut. Fish that eat essential nutrients do not suffer from ill health occasionally and grow very fast. Well fed fish also maintain an attractive color, looking quite beautiful in the process. 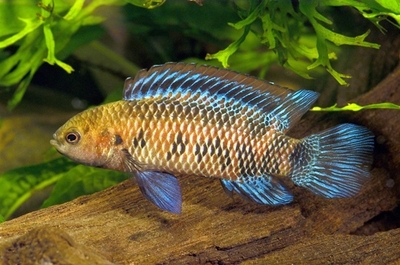 The badis badis is capable of changing into a variety of colors, sprucing up a tank. For maximum utilization of this characteristic in the badis badis, provide essential feeds, by occasionally alternating the foods to avoid monotony. Classified as micro-predators, they mainly feed on insect larvae, worms, crustaceans and zooplankton. In captivity, they do not easily feed on dried feeds. Instead, offer them glassworm, daphnia and Artemia. While they tend to be shy, under low light, they feed well and may have issues with obesity if a lot of food is provided to them. To keep this to a minimum, perhaps having other tankmates to help clear some food is a necessity. Foods like tubifex and bloodworms should not be provided to the fish as they are reported to make them susceptible to fish disease. Remove other tankmates so that the fry can survive. Remember, some fish species eagerly feed on fry whether it belongs to them or other tankmates. Decide whether to put in one male in the tank with the female or a variety. If more than one male is to be put into the tank, ensure there are caves for them to inhabit during this period. The tank should be big enough to house them too. As the males fight for female attention, they will exhibit bright colors. While in their caves, combative males will attempt to drag the female into the cave during which they may lock lips. The willing female then accepts the offer before spawning takes place. A female may lay anything from 30 to100 eggs. After the eggs have been fertilized by the male, the female is ejected from the cave while the male stays put. During this point in time, the male will defend the eggs while fanning them using its fin. After about 2-3 days, the eggs hatch but the fry are still weak and only begin to swim in about 7 or 8 days. As soon as they begin to move, the male is likely to begin feeding on them so it is important to remove it from the tank. At this stage, the fry are still young and should be fed on micro-worms. Artemia nauplii can be added to the feeds too. The badis badis is not very aggressive and can tolerate same size fish. Some of the recommended fishes include some type of tetras, less aggressive corydoras and even angelfish if the tank is big enough with a lot of plant coverage for hiding. As it changes color quite rapidly, it is sometimes confused with the chameleon fish. When shopping for badis badis, a hobbyist must be careful otherwise a different species may be provided instead of the badis badis. The badis badis is a lovely fish that will automatically spruce up a tank. It is therefore a very cute addition to the aquarium.